Greetings, Heart Sisters and Friends! Beginning with National Wear Red Day� Friday, February 5, 2010, millions of people helped spread the word that heart disease is women's #1 killer. The Red Dress�, the national symbol for women and heart disease awareness, was created by The Heart Truth� in 2002 to deliver an urgent wakeup call to American women. For this reason, February was the busiest month ever for the Women's Heart Foundation with a Red Dress luncheon set for Feb 6. The best laid plans had to be postponed however, due to a blizzard that left two feet of ice mixed with snow. Although we celebrated a week later, it didn't ice our spirits and we enjoyed a marvelous day with good food and good friends. Ninety attendees, 12 exhibitors, a Red Dress Trunk Show by Lord and Taylor, survivors' stories, an awards ceremony and a keynote presentation by John E. Strobeck, MD, PhD - "Introducing the Multifunction Cardiogram (MCG)" - made for an exciting event. Audience members were blown away with the simplicity of the MCG tool. Dr. Strobeck revealed he has been using the MCG technology in his practice since 2007 to more easily diagnose heart disease. It's quick, easy to use, inexpensive and extremely accurate. What's more, it is completely risk-free. The MCG represents a major breakthrough in modern medicine and in diagnosing ischemic heart disease. It is what we have all been waiting for. A 4-minute tracing of the heart takes place that is similar to an Electrocardiogram (ECG), but it is not an ECG. The MCG is an extremely sensitive device with a built-in computer. The local MCG computer communicates your reading to a much larger computer over the internet. The reading is then analyzed at a data center to compare it to 50,000 others. The results are then sent over the web to your practitioner's email in-box. You and your practitioner receive a full report in just 10 minutes! As I am turning 60 this year, I am reminded of the fact that both of my parents underwent heart bypass surgery at age 60, and only one of them survived. My father made it through the surgery, but not without complications of impaired cognitive functioning that worsened over time, and my mother died on the operating room table. So, as you may have guessed, my #1 New Year's resolution is to have an MCG to help fight my #1 health risk: heart disease. Everyone in our audience expressed interest and hope that this machine will soon become available nationwide. It has been in use in many European countries for years. The test results will answer that formidable question -- "How's my heart?" Health professionals may want to view the article below to familiarize themselves with this new technology, with website links to a video presentation by Dr. Strobeck. Medicare and Medicaid have set forth guidelines for reimbursement of the MCG test. Incidentally, the U.S. News and World Report rated the Valley Hospital in Ridgewood, New Jersey - where Dr. Strobeck practices cardiology - as one of the best hospitals in the country. The hospital is part of the Columbia Presbyterian Medical Center network of hospitals in New York. Perhaps offering the MCG test is one reason why the Valley Hospital earned this esteemed designation. Congratulations to Dr. Strobeck and to the Valley Hospital for this achievement. Next month, we will be introducing updates to our Medication Safety program. Medication Safety Week is April 1-7. Follow the 7 focus days for guidelines when taking medicines. Please support our mission and make a tax-deductible donation today at www.womensheart.org. Our future for becoming a healthier nation depends on it. Donate today. Pictured above: John E. Strobeck, MD, PhD, FACC, delivers keynote presentation at the Women's Heart Foundation Red Dress Luncheon Feb 13, 2010 "Introducing the Multifunction Cardiogram". Click on photo to view enlarged image. Joseph T. Shen, MD is a brilliant mathematician who is also a cardiologist and concert pianist. Twenty five years ago, Dr. Shen had an idea that mathematical algorithms could be developed based on ECG readings of patients about to undergo revascularization procedures, thereby advancing technology for all of mankind. The invention of the Multifunction Cardiogram was the result - a device used to diagnose ischemic heart disease objectively, at a fraction of the cost of traditional tests, and without any risk or gender bias whatsoever. Dr. Shen was recognized with the Women's Heart Advocate Award for Leadership in Science and Medicine. Joan Hollendonner is a Grants Manager of The Horizon Foundation for New Jersey (the Foundation) who attended the Red Dress Luncheon as a representative of the Foundation. 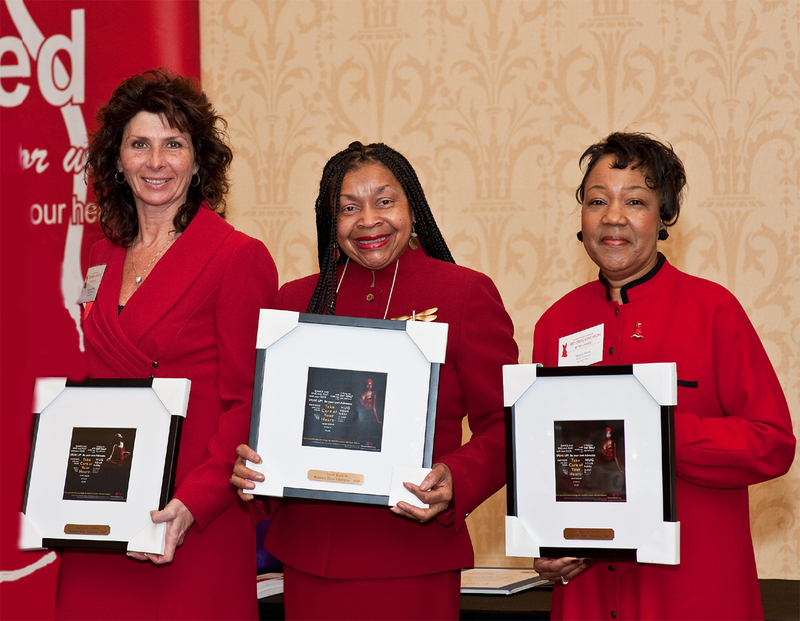 The Horizon Foundation for New Jersey was recognized with the Women's Heart Advocate Award for Healthcare Leadership, supporting the Teen Esteem program for prevention and wellness. Meet heart disease survivors and Champions (L to R) Marianne DiMola, Terri Barlow and Marcia Davis. Click here for more photos and story. The Women's Heart Foundation was awarded a $10,000 grant for the 5th consecutive year from the PACF to continue its Teen Esteem Health and Fitness program at Trenton Central High. WHF co-administers the intervention project for at-risk teen girls. The program entered its 6th year this past September and has consistently resulted in participants making better health choices and remaining in school to graduate. The PACF motto is "promoting philanthropy to advance the well-being of our communities forever." Raising Heart Fit Kids Does your child have a heart-healthy lifestyle? WHF's new bookmark for parents and kids is designed to help raise awareness of early risk factors for heart disease and how to avoid certain risks. The health message also relates to a new website about to be launched that is dedicated to helping schools better track the health status of their student population. The HeartFitKid.org website will officially launch in late spring 2010. Bookmarks and posters are now available. Several schools have begun disseminating the WHF bookmarks and posters that fit together nicely with the "Be Well" booklet from the Susan and Michael Dell Foundation. The Millville Women's Club took part in underwriting the cost of bookmarks for students in the Millville middle school. For information on how to order HeartFitKid bookmarks or posters, contact us. There are two new enlightening books that are easy reads for consumers of health care. These books promote accepting responsibility for one's own health and offer some exciting new ways to take care of your heart and your health. "Knockout" by Suzanne Somers. In this book, Ms. Somers talks about her recent near-death episode and interprets this as a learning experience. She seeks out those health experts trying to improve cancer care by incorporating a more "whole health" approach. Questioning the status quo, she uncovers political, social and financial gain for keeping patients on track of receiving oft-times ineffective chemotherapy agents that can do more harm than good. Ms. Somers is applauded by the medical leaders she interviewes in her book for her courageous attempt to improve patient care. She also interviews cardiologist Dr. Steven Sinatra, and discusses her own personal health plan that includes use of bio-identical hormones (hormones that occur naturally in the human body and that are not from a pharmaceutical company, claiming this maximizes her health to fight both heart disease and cancer while helping to maintain her youthful looks, figure and level of energy. Ms. Somers does an outstanding job in chronicling her journey and in advocating for patients' rights to self determination through the power of education and personal choice. Ridding the body of toxins, promoting drainage within the body and reducing inflammation are all key to avoiding the two top killers responsible for premature death: cancer and heart disease. "The Eat-Clean Diet" by Tosca Reno. This colorful and insightful book discusses a healthy lifestyle through the eyes of Ms. Reno with practical advice on "Eat-Clean" foods and avoiding toxic foods, toxic environments and toxic relationships. She shares her personal journey in fighting obesity as if she were sitting across the table from you, sipping a cup of green tea. A good read and great for any parent looking for supportive ways to intervene with an overweight or underweight child. It comes complete with delicious recipes, menu planning, ways to renovate your metabolism and grocery shopping tips with a list of "super foods" - nutrient-dense foods that we should be eating every day. Volunteer Corner Robin Heston was recently recognized as Volunteer of the Year for her outstanding contributions to the Women's Heart Foundation and serving as Chair of the Run for Mom event for the past 6 years. Robin has also organized jewelry collection campaigns to sell refurbished items to benefit the WHF. She is a leading Women's Heart Advocate in our state and I am proud to call her my friend. THANK YOU, Robin, for caring for the hearts of the women in New Jersey!